The Chase Foundation in Los Angeles, California, hired The Shoestring Agency to undertake a communications and branding audit because the organization’s leaders felt they may have “outgrown” their current brand and marketing focus. The result was a comprehensive report and a decision to undergo a rebranding and communications improvement project. Under the guidance of the family and stakeholders, Shoestring Agency was able to get to the heart of the organization and what the brand should communicate. The goal was to determine how they want their audience(s) to “feel” about their organization when they see the logo and marketing pieces. The new logo conveys a sense of whimsy (capturing the essence of childhood) while still remaining a respectable and serious logo. Additionally, the “pinwheel” has come to be a representative icon for the organization and its cause. The tagline — “Helping hospitalized kids Be kids” — is simple and to the point while sparking empathy and understanding. The new logo and tagline make it extremely clear what the nonprofit is all about, and it does it in a beautiful and highly memorable way. 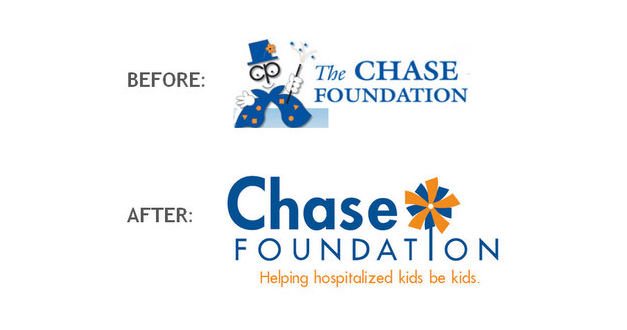 Learn more about the Chase Foundation at ChaseFoundation.org.